9-36 Kg, 9 months to 12 years approx. Install with Isofix & Top Tether (Universal) and later with the 3-point seat belt. ECE R44/04 Approved. Universal Classification and ready to shortly gain R-129 I-Size approval. 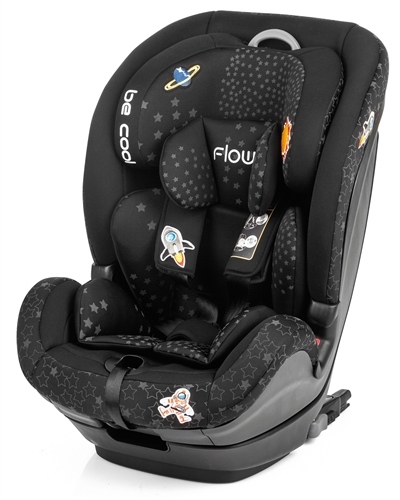 The FLOW car seat is quickly and easily fitted in the car in a forward facing position using ISOFIX anchorage points and a top tether and can also be installed using the vehicle seat belt. Colour indicators on the ISOFIX confirms correct installation. Group 1/2/3 car seat equipped with isofix and top tether, approved under Standard R-44 and ready to shortly gain R-129 I-Size approval. Adjustable headrest to cover up to 150 cm. Includes very comfortable textile insert for group 1 which, together with the 12 degrees of reclining, make it a very comfortable seat. Includes removable padded insert cushion for younger children. Auto-adaptable harness positions according to the height of the headrest. Group 1 stage: Can only be used with ISOFIX and the third anchor point (top tether). Group 2 & 3 stages: Can be used with the double ISOFIX points without the third anchor (Top Tether) and with the vehicle 3-point seat belt at the same time.